Anyone who’s ever moved their household knows there comes a time in the move when the big stuff is gone, the good stuff is packed and what’s left are the odds and ends of life lived in one place. It’s that catch-all drawer with all the strange stuff that is an archeological history of what you’ve been up to. Milestone’s Volume 4 of their tireless Project Shirley is that catch-all drawer at the end of the move. It is filled with material that will bore the unimaginative and fascinate the students of Shirley Clarke. In short, yes, there are home movies. There is a similar effect in the literary world where, once all the author’s books have been reviewed and analyzed and the biographies written, the scholars go back with a fine-toothed comb through the author’s letters, notes, bar tabs, shopping lists, and whatever is left in the author’s estate to get that extra angle on their subject. Bitter picayune battles are fought in dim academic corridors over what Melville had for lunch on Thursday. Careers are made and broken over scraps of paper that the author would have tossed out had those scraps not slipped to the back of the desk drawer. Happily that kind of academic drama is not at play here in The Magic Box (though I’ll be surprised if it doesn’t find its way as a resource into a few Film Studies dissertations). No, the three-disc set of The Magic Box is that catch-all draw at the end of a move. It is full of sentimental leftovers and lesser works. The utility of The Magic Box is that it makes accessible that which is usually unavailable. Chance, and the perseverance of Milestone, have made this possible. And like a catchall drawer, there is often something at the back that makes you glad you looked — that forgotten $20 bill, the spare set of keys, or (you fill in the blank). In Magic Box this lucky find is Clarke’s Oscar-winning doc Robert Frost: A Lover’s Quarrel With the World. I did not expect to find something like that here, and what a treat it is! The three discs are divided into “Experimental,” “Dance,” and the catch-all of the catchall “Robert Frost & Home movies.” While those titles are mostly right, maybe they could have been just as easily discs one, two, and three... a minor point. The whole is curated nicely with an accompanying booklet. Brussels Loops, from the Experimental disk, is amazing art-filmmaking, but I wonder if it was originally meant to be simply film wallpaper for the US pavilion at the Brussels World Fair of 1958. In 2016, it has an entirely new and ironic meaning of excessive consumption... you have to love the full-frame shots of acres of packaged meat, acres of parked cars, and acres of single family homes. The dance footage of Clarke in her early pre-filmmaking days is sentimental fun, while her later 1980s video work in Four Journeys in Mystic Time closes the circle in her dance and film worlds. Along the way comes Clarke’s In Paris Parks where she’s learning how to make a film... an art piece growing out of home movies. And then there is the test footage (or experimental film, your choice) of French mime Decroux which seems to me to be a great, yet accidental, art film. 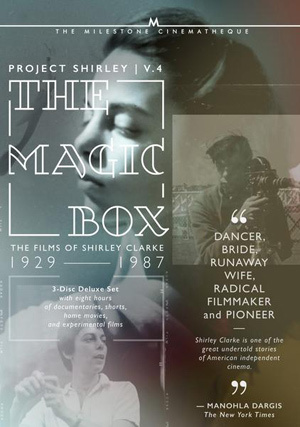 The Magic Box, Project Shirley Volume 4 is not for everyone so all the more reason to tip your hat to Milestone for having done the right thing by bringing it to us.